Case of Best Whip cream chargers – ideal for cafes and restaurants. We supply all of Gordon Ramsay’s restaurants with our Best Whip cream chargers and cream whippers. 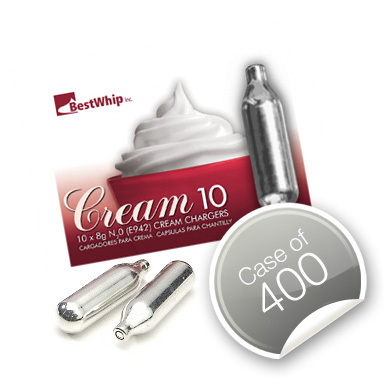 A case of 400 is a lot of cream chargers – the gas inside them can be misused as a narcotic so when you checkout you will be asked to confirm why you require 400. Manufactured in a brand new (2009), purpose-built factory in Taiwan which features state of the art filling and selling machines, electronic weighing and quality control. ISO 9001, NSF/ANSI 18, and German TV-Mark Certified. Filled with certified 100% pure N2O. No oily residues in your cream. Universal (standard 8g screw-in system) fitting – not for Push-Valve (Kisag) system or 16g whippers. Each charger is weighed electronically to guarantee no empties. OVER 18’s ONLY: This product is not for sale to under 18’s. Resellers please ensure your customers are over 18.